You may notice the picture in this post is a little different than the previous post. We had to get a new shaderoom. Saturday into Sunday at 8am sharp we had a torrential downpour. We quickly closed up everything, and I sat to enjoy my cup of java, looked out the window, and saw our year-old shaderoom collapsed under the quickly accumilated weight of the water. We went out to use the cover as a tarp to cover best as possible. After the storm, I went out to assess the damage. the frame (which had been weakened by using on the beach once) bent inward, and the legs bent down following the frame. Only thing salvagable is the cover and screws that connected the frame rods. The other effect of the storm was cell service was knocked out. Only if I walk up to the entrace to the campground did you get even two bars of service. That seems to be restored now - Late Monday. 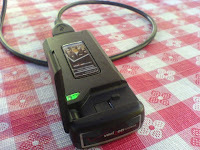 To get online this week, using a Verizon aircard modem from work to connect - just as easy as using my cell as a modem, maybe easier. Nice sitting at the picnic table and checking in at work, researching prices for shade rooms, or just doing a bit of surfing. Quick too!